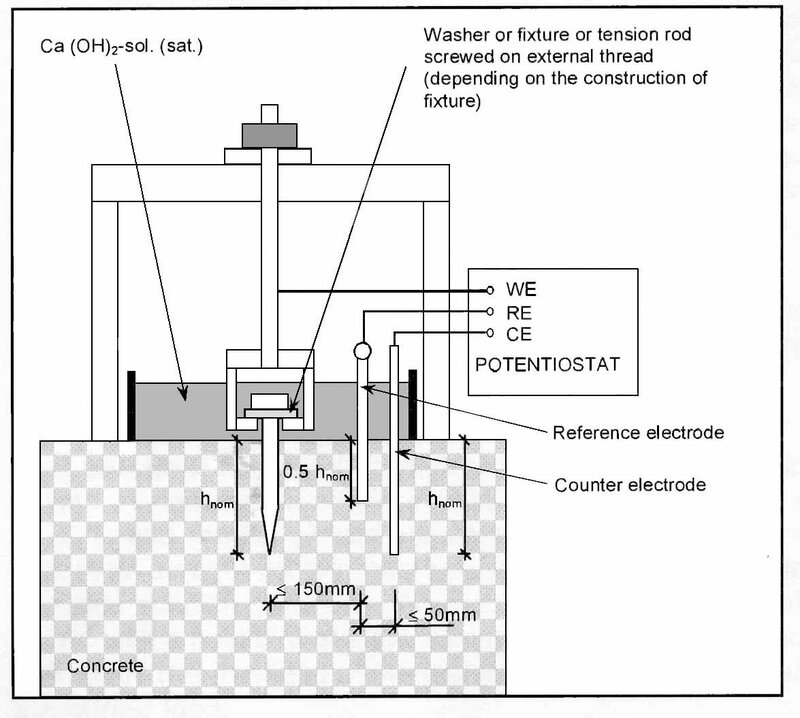 This page describes some projects from the past which deviate in their execution from a normal corrosion measuring setup as they contain customer-specific extensions. They should serve as an information example for solutions that are feasable with our systems. In accordance with the latest requirements, the fasteners are checked mechanically and electrochemically. Complementary to the mechanical tension testing facility of a tool manufacturer from Lichtenstein we have delivered the components for electrochemical testing of setting bolts. For better handling and for protection of the electronics, the potentiostats are integrated into an electrical enclosure, wired and passed to the outside in appropriate length. 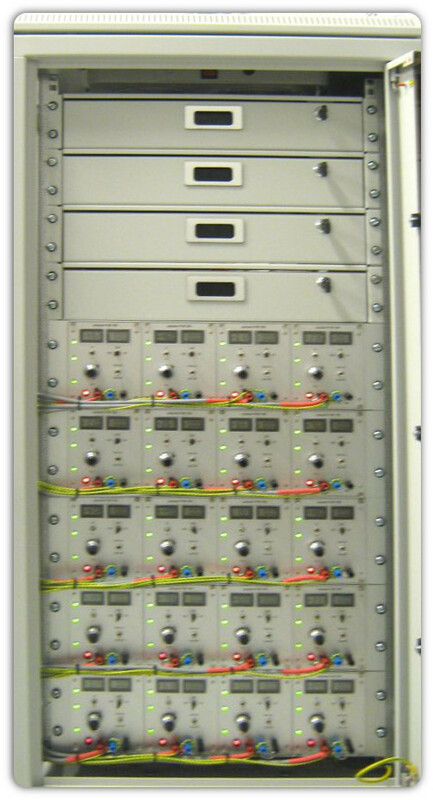 The image on the right shows the electrical enclosure with twenty potentiostats. The front of the cabinet will be closed by a glass door. So the instruments can be read off and the devices are protected. The lower image shows the schematic layout of such a testing device. In the corrosion research beside known values such as current density and potential also the measurement of additional physical or mechanical values is demanded. Thereto standard solutions are often not sufficient. On hand of an actual example, we want to show the possibilities of today's technologies and modern tools. Furthermore, a power source should be switched time- and temperature-depending. The power should reduce the wall thickness of a pipe. The resulting residual stress should be measured. The following overview image shows the solution worked out with the customer. The junction box was fitted in addition to the standard equipping for the connection of a potentiostat also with a potential-separated module for the connection of a temperature sensor. For the strain measurement a Spider8 by HBM was chosen and for the measurement of pH-value, conductivity and solute oxygen a multifunction measuring device by WTW. As software our standard software for corrosion measurement and the program package VISUAL DESIGNER™ were used. With VISUAL DESIGNER™ all tasks were programmed that went beyond the corrosion measurement. A first application for the Spider8 (strain measurement), the control of the power source and the temperature monitoring was realized. With the first application the customer obtained an instruction in the programming with VISUAL DESIGNER™ as part of the commissioning. Here he got to know a powerful graphical programming tool by reference to a known task so that he can quickly do changes himself that occur inevitably in the later process of the research project. The next image shows how such an application as block diagram may finally look like. For the customer a powerful and flexible measurement setup was built that can always be adapted on new tasks easily and quickly. 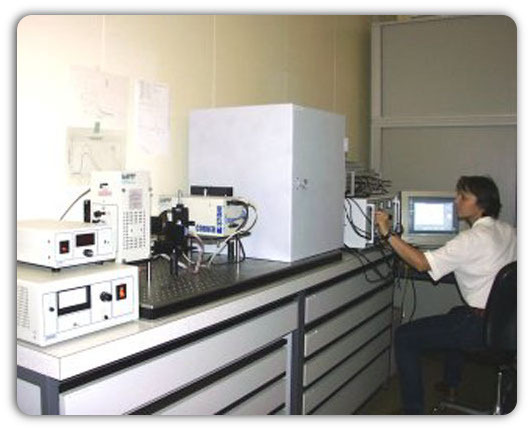 During 1999 we received an enquiry from a Swiss research institute referring to a photoelectrochemical measurement setup. The system should measure photoelectrochemical currents on oxidic semiconductors. It should consist of a sensitive potentiostat, a light source, a chopper, a monochromator, a shutter, a filter wheel and of course of a data acquisition and automation system. Furthermore a Lock-In amplifier should be used to acquire the relatively small photo currents. The Lock-In amplifier should be controlled via an IEEE 488 interface and a separate software that practically should run as a second task on the computer. In addition the control of the monochromator should be realized via the IEEE 488 interface. 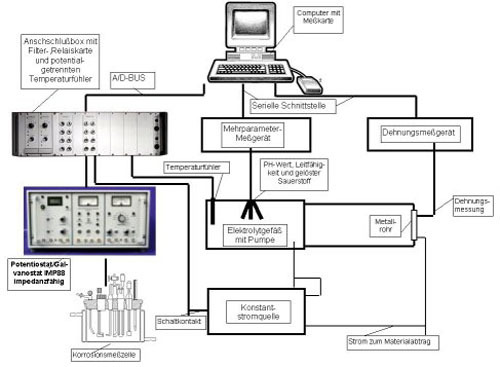 A similar system was built up at the ETH in Zürich in the past and was used for similar measurements. At that time no distributor was available that could modify its software accordingly this was self-created with the help of graphical development tools. After clarification and review of the requirements we came to the conclusion that the Lock-In amplifier could be replaced by an AC-voltage-amplifier in the potentiostat. The control of the monochromator was planned via the serial interface and integrated into our software EcmWin. Thereby an IEEE interface, the Lock-In amplifier and the necessary software could be used from the stock and that resulted in a significant reduction in costs. After the ordering we expanded our software EcmWin with a function module for photoelectrochemical measurements. This module controls the rotation speed of the chopper, the monochromator with filter wheel and the potentiostat. As alterable value for the measurement the wavelength of light in 5nm steps or the potential for the sample can be preset in 1 mV steps. The procedure can run manually or automatically over a defined range. The potential of the sample, the photo current (AC and DC part / component), the pure AC part / component (over the additional AC-voltage-amplifier of the potentiostat) and the trigger signal of the chopper are aquired. The phase shifting between the trigger signal of the chopper and the AC-component of the photo current, the effective value and Imax - Imin of the photo current are calculated. 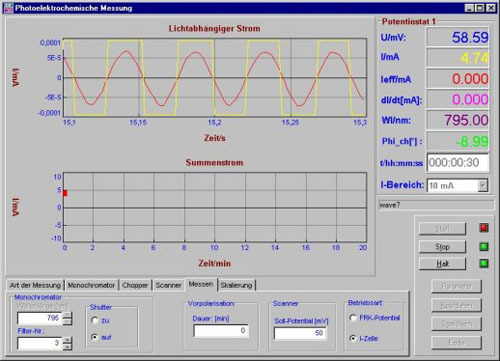 By the normal photo current measurement in the upper graphic the trigger signal and the AC part / component of the photo current are displayed. In the lower graph of the DC and AC part / component of the photo current is displayed. The depiction / view takes place with 500 values per second for each channel. Therewith chopper frequencies up to approximately 50Hz can be good displayed. For higher frequencies the software can also be set to 1000 values per second. Out of the measured values practically all relevant variables can be mathematically determined. Compared with the data acquisition of a Lock-In amplifier here is more information about the signal curve / graph present ie the raw data is practically available. During the transients measurement the chopper is halted and the wheel is positioned so that the light can fall unimpeded onto the sample. Then the data acquisition is started, the shutter is opened for a short time (5 to 10 seconds) and then closed again. The photo current of the turn on and off process is ascertained and stored. Since the time of delivery not all specifications for the software were clear so we also supported the user with corresponding modifications in the period that followed. The aspiration is a flexible and easy to use measurement setup that makes all relevant functions for the photo electrochemistry available.